Soph bought some fermented black beans a few months ago, and we’ve only used them a couple of times. It’s time we broke them out again, so we’re doing beef and fermented black beans tonight. We’ll fry up sliced beef steak with garlic, ginger, chillies and szechuan pepper, before adding the veg: onions, green peppers, French beans (as the garden won’t stop producing them…). Then we’ll add the sauce made from fermented mashed black beans, soy sauce and rice wine vinegar, and serve with rice. This worked really well. The spice mix was perfect: nicely salty and black bean-y, with just the right amount of heat (not blindingly hot, a change for us!). 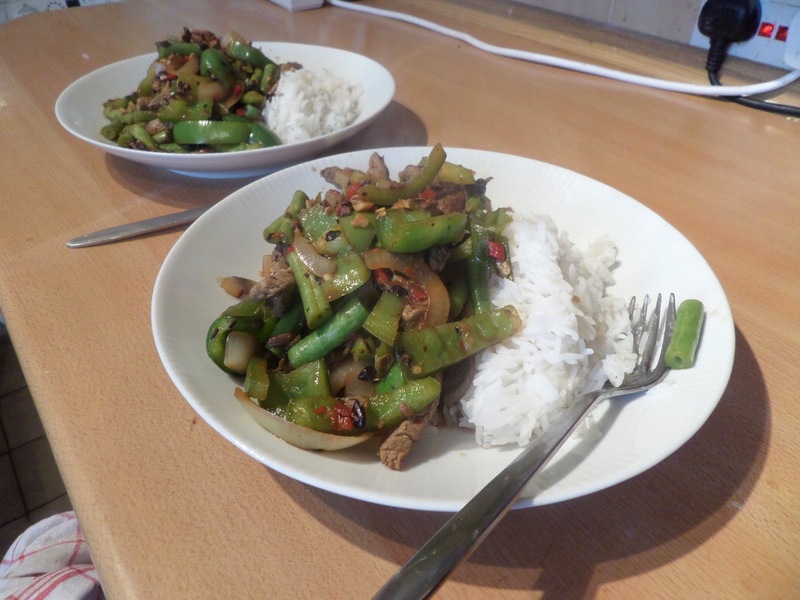 Surprisingly the French beans worked really well, not just the right colour but the flavour worked as well.